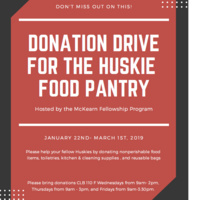 Please help your fellow Huskies by donating nonperishable food items, toiletries, kitchen and cleaning supplies, and reuseable bags. Please bring donations to CLB 110F on Wednesdays from 9am-2pm, Thursdays from 9am-3pm, or Fridays from 9am-3:30pm. Honors students will receive 2 Honors Bucks if they donate 5 items!